On the History Channel's "Modern Marvels - Pirate Tech" that recently aired, some 18th century pirate cannon ammunition were displayed and discussed. One such item was the "fire arrow" which was a metal arrow with a large sphere a few inches behind the point of the arrow. This sphere was the size of a cannon ball but its exterior appeared to be closely wound with small diameter rope (tarred). This sphere enclosed flammable materials like sulfur that "would burn for a long while." The arrow itself seemed to me to be about two feet long (pure guess). Just in front of the "ball" were two short (6" ?) pieces of chain with a metal hook on the end of each. There were two more chains/hooks just behind the sphere. There was a short animation piece that showed the "fire arrow" being fired into an enemy ship's sails. The hooks would catch on the sail and shortly afterward the sail would be on fire. Has anyone ever heard of this fire arrow? Could it have been a pirate device only? All of the other weapons and devices that were supposedly "pirate tech" were just items stolen from ships they captured. This was the only thing I did not recognize. The narrators were careful to note in several places that pirates did not try to sink a target ship since they wanted the cargo, not to watch the ship sink. I would think that whoever shot a "fire arrow" at a target ship would have to be very careful. Pieces of burning sail material falling to a deck with gunpowder present might have a very poor result. Note: In the show the name of this device was called "langridge or fire arrow." Langridge (or langrage) is, of course, incorrect since langridge is small pieces of scrap metal packed into some sort of container (various shapes) and fired as an antipersonnel weapon. Nelson was hit by a piece of langridge on his forehead at the Battle of the Nile and had to go below for a short period. If he had gotten hit by a burning two feet long metal arrow on his forehead, I very much doubt that he would have returned to the quarterdeck -- at least on his own two feet. I question the authenticity of this. I saw the special too. I taped it in fact. I think that pirates, who perferred to board an enemy vessel, and not destroy it, would definately not use this fire arrow. The one thing that many sailors feared was the rigging being set on fire. Nelson himself did not like having men with muskets in the tops due to the chance of the firing causing the rigging to catching on fire. Once the rigging caught on fire, the next thing to happen most likely is to have a rain of rigging that was on fire, catching the whole ship on fire (something you would not want to do as a pirate). Looking at the tape, the person who shows us and talks about this fire arrow is Gary Harper, with the description of "Black Powder Specialist" below his name. Looking for him online, I cannot find anything on him. How is he a expert on Piracy? He also mentions that there is sulfur and saltpeter in that ball of burning substances at the end of the fire arrow. Thats basically gunpowder, just minus charcoal. The saltpeter is dangerous enough. Also, he refers to grape shot as being common. I am pretty sure that grape shot was used mainly by the navy. Pirates and civilians would have used langridge and canister. If someone could verify that for me, I would feel better. I have a book called Man-of-War, that has a picture of something that looks similar to the fire arrow thing. The book doesn't give a specific name for it, which is a bit annoying. It looks like it doesn't have the arrow bit, just the chains with hooks. I'll see if I can find an on-line version of the image. If not, I'll scan it when I have a moment. ... I think that pirates, who perferred to board an enemy vessel, and not destroy it, would definately not use this fire arrow. Looking at the tape, the person who shows us and talks about this fire arrow is Gary Harper, with the description of "Black Powder Specialist" below his name. It sounds like neither of us think that pirates would use any type of incendiary weapons against a target ship. I wondered what word Mr. Harper could have been struggling for when he said "langridge." I did some more research. It's possible he might have meant "carcass" as the name of the projectile he had in his hand. Saying "carcass or fire arrow" makes a lot more sense when looking at the following webpage (CLICK HERE for more information.) There is no arrow nor any hooks but those might just be variations on the theme, especially since Susan has found one without the arrow but with the hooks. I am still interested in this type of projectile since pirates fought against ships other than target ships. If a British Royal Navy ship was intent on capturing a pirate ship, I would expect that a pirate ship would employ any means, including a "fire arrow" to escape. I do not believe that pirates would have manufactured such devices, so from what navy (or navies) did they steal or capture them from? I have never read of these things but since they would have been a good substitute for "heated shot," I'm surprised I haven't. The article above seems to say that such projectives were common. It also says that they were a French invention -- is that a clue? Don, I think I found your answer. Examples of the successful use of the carcass were the destruction of a Turkish fleet in 1788, by the Russian force under the command of Sir Samuel Bentham, and the immolation of the Danish flagship Dannebrog by the Glatton, Captain William Bligh (of Bounty fame); forcing Commodore Olfert Fischer to shift his Broad Pennant to the Holsteen and to ultimately loose control of the Battle of Copenhagen, 1801, that led Crown Prince Frederick to prematurely surrender the Danish forces before Copenhagen. Odd thing is that all these references are to either the Revolutionary era or Napoleonic Era. Why wasn't this used more, or at least reffered to more? My guess is that either some sort of "chivalry" code made it "un-ethical" to use such nasty weapons and not traditional shot, OR they were expensive, so ships would only use them when they thought they would be most effective, explaining them being common and explain why they aren't recorded as much in use like round shot or chain. Here is another interesting source, the Cyclopædia, The First Volume (1728). Digital pictures of the original, at just look under Carcass. I thought that finding the Cyclopædia was interesting enough. Thanks, Brit.Privateer for the information. I wonder if anyone can find some confirmation of Bligh's use of carcass projectiles against the Dannebrog in the 1801 Battle of Copenhagen. This would confirm that the British Royal Navy had such devices in their inventory. I can find lots of sources on-line and in a few books that the Dannebrog was set afire early (and eventually exploded) in the battle against the Glatton but not the "reason" for the fire. Last edited by timoneer on Fri Jul 14, 2006 7:26 am, edited 2 times in total. Here are the fire ball things. I poached this from a PDF file I found on a Danish navy site. The color version in my book is a little more dramatic. Thanks for the image. I had to save it and then open it in Paint to be able to read the text. 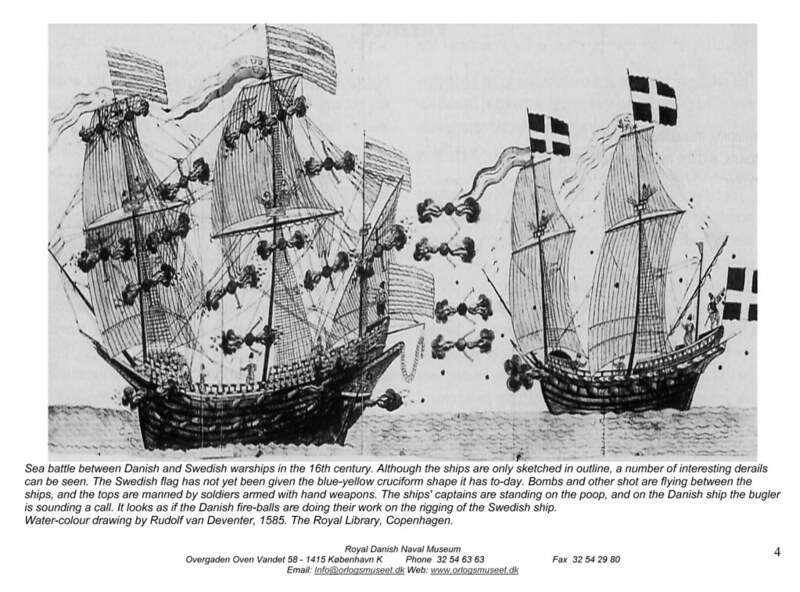 I would say the Swedish ship is in a bad way since the Danish ship appears to be the only one firing "fire-balls." Since this is supposed to be a 16th century image, it appears to confirm the early use of such devices. Susan, you mentioned that the book's title was "Man-of-War." Who is the author? Donald Macintyre & Basil W. Bathe. First published in 1968. Without a source at hand to quote, I do recall several references to the French attempting a variety of types of explosive shot early in the Revolutionary War period as a means to equalize its navy's effectiveness against the British. In the end, the attempts were deemed failures as the French vessels typically blew up before the British ships did, a complication of inaccurate fuse lengths and dangerous explosives on deck. It provides a brand new appreciation for the British use of Congreve rockets and bomb vessels. To that end, though, I would not be surprised that the French hadn't developed carcasses or flaming arrows, given their reputation for disabling an opponent before closing in for the kill, and with a flaming arrow projectile, it wouldn' even be necessary to close the range. As ammunition for pirates, I'd agree that it would seem rather unwise when one's aim is to seize the cargo, the valuables and the vessel (especially if the craft is larger and faster than one's own). In the end, the attempts were deemed failures as the French vessels typically blew up before the British ships did, a complication of inaccurate fuse lengths and dangerous explosives on deck. Actually Aaron, as far as I can determine, the carcass was just an incendiary device rather than an explosive one. There was no fuse. I understand that it was ignited through vents in the sphere by the normal powder explosion when the cannon fired. Thus the carcass was only set afire as it left the cannon’s mouth and would not have been much of a danger to the ship firing the carcass. I assume that there was "some" danger but a lot less than with an explosive shell. I wanted to make one additional comment that goes back to my original post concerning the "flaming arrow" displayed during the "Pirate Tech" special and HMS Charity's post. On the shaft of the arrow were two circular disks that appeared to be made of wood to me. One was near the end of the arrow and the other was fairly close to the flammable "sphere." These disks were of a much smaller diameter than the sphere. I believe that this "flaming arrow" was meant to be fired from a small diameter cannon (maybe even a swivel gun) that matched the diameter of the two disks. This would match the comments in the show that pirates rarely used large diameter cannon since they did not want to take the chance of holing the target ship and sinking her. I believe that the larger "sphere" never entered the barrel of the gun. I do not remember seeing any "vents" in the sphere but I did note in my original post that the surface of the sphere seemed to be covered by a wrapping of small diameter rope that might have been tarred (giving a flammable surface). Aaron, the point I am trying to make about this particular version of a carcass projectile is that, while it had no fuse, it might have been set afire manually by one of the gun crew just prior to the cannon being fired. If my observations of the device are correct, the particular projectile displayed might have been a little more "dangerous" than the versions discussed on the links in the previous posts where the ignition of the sphere takes place in the barrel as the cannon is fired. In either case, both the animation in the show and the image posted by Susan showed the carcass afire during its trajectory to the ship being attacked -- not catching fire after the hooks attached themselves in the sails (fused in some manner). Since Brit.Privateer taped this show, maybe he could re-watch this segment and see if my observations are accurate. I did record the show and watched this segment several times but I have since erased it. In Marshall's Practical Marine Gunnery by George Marshall (published in 1822), there is a recipe for the "Composition for Fire Hoops, Fire Arrows and Lances" (mealed poweder, sulphur, saltpetre, and linseed oil). There is no illustration, so there's no way to know if this fire arrow was the type shown in the Pirate Tech show. Thanks, Susan. At least you were able to confirm that the name "fire arrow" is associated with marine gunnery. That was more than I could do after quite a bit of looking on-line and in book indexes. I had to make the jump to carcass to get any information at all. BTW, I am always pleasantly surprised at the books you seem to have access to. The only thing that is mind-boggling now is the fact that, after your post, I am scratching my head about "Fire Hoops" and [flaming] Lances as they apply to marine gunnery! I only know fire hoops as something an entertainer or trained animal jumps through at a circus. The idea of a sailor standing on deck prepared to toss a burning lance or flaming hoop at an enemy ship borders on the surreal. If I could only hop into a "way-back" machine and work for the Admiralty at Portsmouth circa 1800. I would spend all my spare time poking around in all the storehouses, watching all aspects of ship building and fitting out, troding every deck on every ship in port, and asking a zillion questions to every sailor and officer who would listen. Oh well. If "ifs and buts" were "candy & nuts," we would all have a wonderful Christmas. In other words, it's doubtful that this trip will happen!